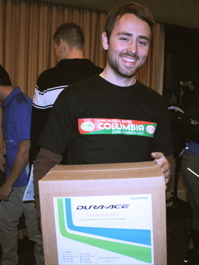 Hey, forgot to mention last month that at the Shimano Tech Seminar in Portland, Shimano gave away a Dura Ace 7900 group. Not just a voucher, they just handed off a box full of DA during the raffle. Jordan Hufnagel of Hufnagel Bicycles, sitting 2 seats to my right, won. He makes cool bikes, so I can…almost…forgive him for winning. Check out his custom steel bikes.